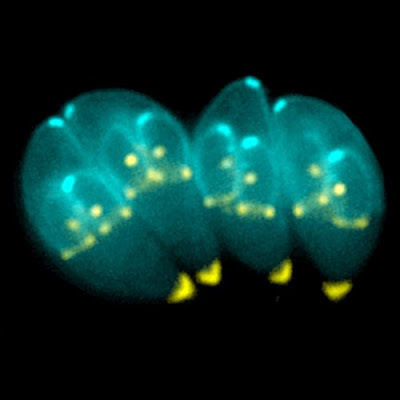 A study by a team of scientists at Einstein suggest a novel approach for treating toxoplasmosis caused by the single-celled parasite Toxoplasma gondii. The results are published in the October 21 in the online edition of the Journal of Immunology, suggest a new approach for treating toxoplasmosis, the disease caused by this parasite. Toxoplasma. gondii is one of the deadliest members of parasite world, that can infect any warm-blooded animal. Infected people are home to thousands of organisms, many of them residing in brain and most infected people have an inactive, or latent, infection without any symptoms. But in those with compromised immune system like the HIV infected, geriatric and pediatric population, T. gondii can cause serious brain damage. People become infected by ingesting T. gondii oocysts (the thick-walled spore phase of the parasite found in the infected cats’ feces) or by ingesting undercooked pork or other infected meat. Once the parasite gets swallowed, its tachyzoites multiply by infecting cells and then reproducing several times within each cell. Finally, the parasitic load ruptures its host cell and exits to infect new cells. While previous in vitro studies had suggested that the tachyzoites go on a five to seven cell division cycles in 2 to 3 days before rupturing the host cell, the recent in vivo study reveals that the replication cycle is much faster. Also the findings have thrown light on why these parasites burst from the macrophage hosts after just one or two rounds of multiplication. It is the macrophages that rush to the infection site, that signal other macrophages thereby causing the parasite to exit the cells. This clue could possibly put forth in developing newer drugs with this mode of action to eliminate parasites by encouraging infected cells to attack and force the parasite to an early exit.